Continuing downstream along the Rhone we arrived at the Pont de Lettre de Tassigny. 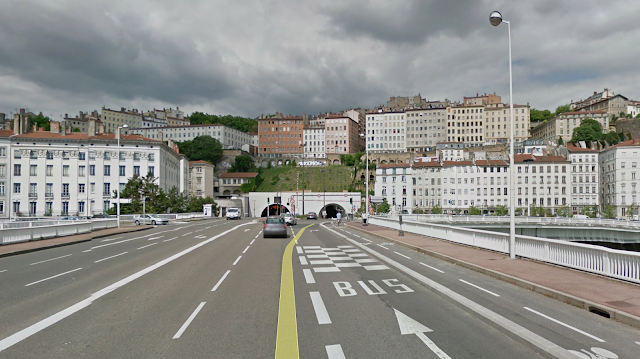 This bridge was built in 1956 to provide access to and from the Croix-Rousse Tunnel across the Rhone. Jean de Lattre de Tassigny was a famous French general who fought in WWII for both the Vichy and the Free French Government and he also fought and helped get the US involved in Vietnam. The Pont de Lettre de Tassigny is 150m (500 ft) long and 25m (80 ft) wide. The superstructure is composed of precast I girders supported on two column bents. The bridge has a 'T' shape with ramps coming off the bridge along the west bank. 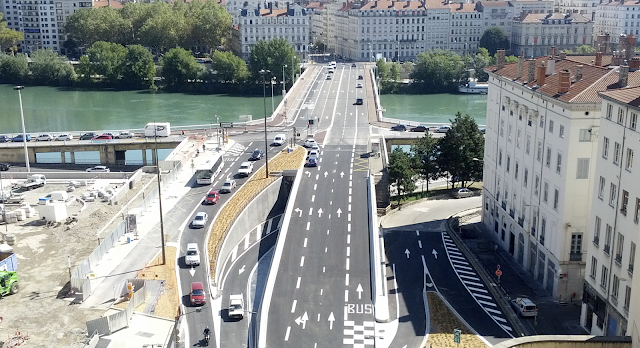 When the tunnel was renovated in 2013 the bridge was modified to include bike lanes. It looks like the bridge was widened? The outer girders are of a different shape, and aren't connected with a diaphragm like the others. You've got good eyes! The bridge must have been widened to accommodate the bike and bus lanes that were added when the tunnel was widened.